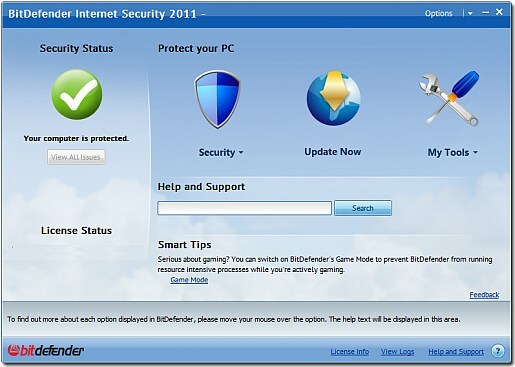 Bitdefender has released their 2011 version with several improvements. The biggest improvement is really an emphasis on an easier to use interface and tutorials. In fact, Bitdefender 2011 has over 31 tutorial videos that one can watch on a complete range of subjects. The interface remains similar to the 2010 version. One can switch from either the expert, basic, or intermediate views. Virus detection and prevention has improved and Bitdefender makes out with an advanced rating (the second highest ranking from AV-comparatives). Below get 91 days of Bitdefender Internet Security for free. The installation of Bitdefender 2011 went smoothly but took a while. The initial download is only 1.3 megabytes in size. However, the full download is approximately 300 megabytes in size so be prepared to wait a while if one has a slow connection. Once the installer launched there are several features that stand out. First, the installer runs a quick scan on the system and then updates the antivirus. The basic theme is that there is a novice and an expert install mode. I chose the expert one because Bitdefender asks for a large amount of personal information. The installer wants to collect Usage information, opt in newsletters, set participation in the cloud network; all selected by default. Once the installer completed the program loaded an initial video. 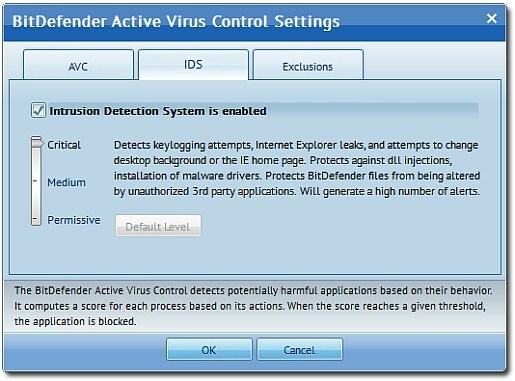 Bitdefender 2011 offers a full system, deep system (must be added onto the interface), quick, and vulnerability scan. The quick scan scans .exe, .sys, and .dll files located throughout the computer. The scan utilizes a memory functionality and increases in speed. The first scan took about 1 minute and 30 seconds while the next one completed in approximately 10 seconds. The full system scan checks files at about 70 to 200 per second and accesses the disk at 4 to 10 megabytes per second. The full system scan took about 1 hour to complete. These figures make Bitdefender 2011 faster than most free antivirus that have been tested. 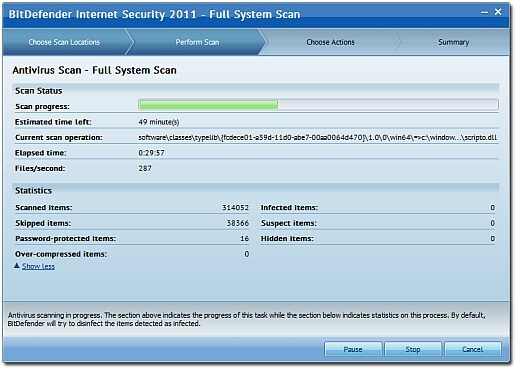 The most unique scan that Bitdefender 2011 offers is the Vulnerability scanner. This checks if a computer has the latest Windows updates, application updates, and if a system has weak passwords. However, it would be nice if the application updates supports more programs than just the most basic (aka firefox, skype etc.). 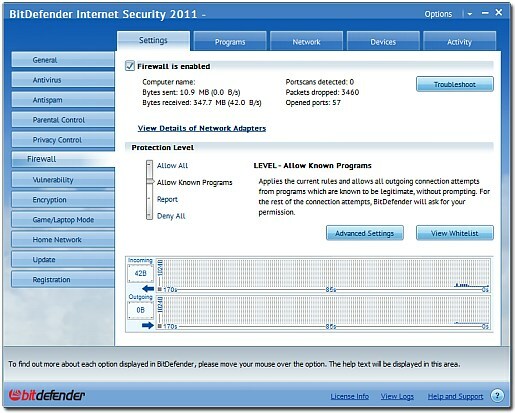 Since Bitdefender 2011 is an internet security program it includes several other features. In addition to a full http antivirus, cloud, and behavioral engine, Bitdefender 2011 includes a full IDS (Intrusion Detection System). The IDS stops keyloggers, dll injections, rouge drivers from installing. There is then a full firewall which auto determines trusted programs that can access the internet. A privacy and parental control limit which data can accessed by certain programs and blocks traffic based upon Windows user accounts. There is an antispam system and also an encryption mode that encrypts msn and yahoo chats. There is a game or laptop mode in which Bitdefender 2011 senses when the ac power is plugged in and disables certain functionality accordingly. Finally there is a home network option which adds a layer of security on a windows networking. Basically, there are about 10 times the features in the average free antivirus and I highly encourage one to take a look themselves (this paragraph does not do justice to the amount available). Resource usage for Bitdefender is on the reasonable side keeping in mind the amount of modules. There are on average about 5 processes in memory using about 120 megabytes of RAM. CPU usage is surprisingly lower than most free antivirus ranging from 4 to 8 percent. I didn’t really notice a system slow down. However, the anti-phishing toolbar does slow down internet browsing significantly. A few problems I encountered with Bitdefender 2011 were just an overwhelming about amount of customizable settings. It also seemed that a lot of protections weren’t enabled. Sometimes the tray icon would disappear even though the program is scanning. There clearly needs to be some improvement on how the windows are managed. I would also like to see more Norton like graphics and information presented in an easier way to understand manner. 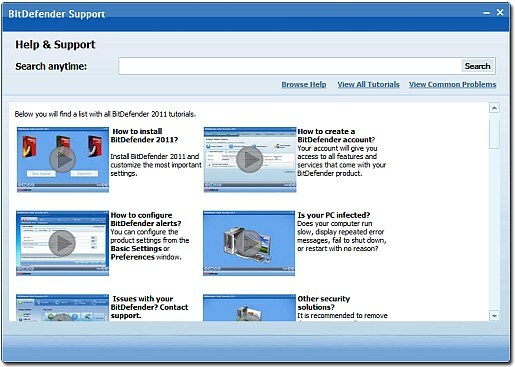 Finally, keep in mind that Bitdefender 2011 is designed for more technical users.